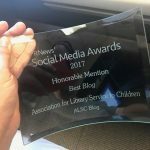 I'm the Children's Services Manager at the New Albany-Floyd County Public Library in Southern Indiana. It was a very snowy day in Denver today! It made me very glad that ALA provides shuttles (sponsored by Gale) to transport attendees to and from their hotels and the Convention Center. Even though my hotel is close to the Convention Center, having the shuttles as an option on a day like today was very nice. And everyone was very patient waiting for shuttles that were maybe having to take their time a bit more with such slushy roads. Yay shuttles!